We recently received a message from one of our readers saying we had never featured any bikes from Benjie’s Café Racer (BCR) and at first I thought he was wrong, until I did a search. Well, you are damn right and it’s about time we did. Benjie Flipprboi is one hell of a bike builder and we can’t believe this is the first Café Racer we have featured from him. The pictured bike is a 1969 Honda CB350 named ‘El Poquito’ (the little one). Benjie created virtually everything on the bike including the the gas tank, seat, stainless steel clip-ons and rear sets, plus most of the remaining parts of the bike are all hand fabricated. 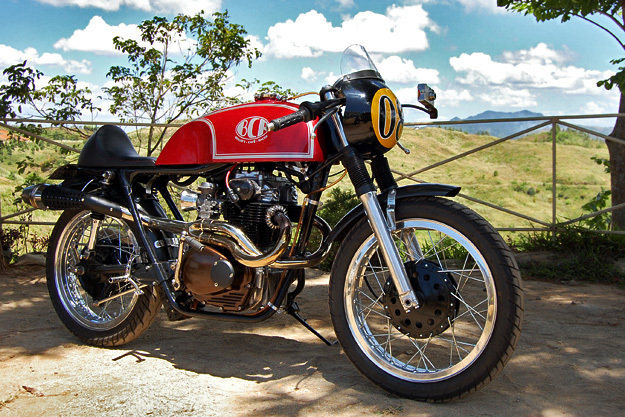 This is one beautiful Café Racer and we appreciate the hard work that’s gone into it. For the whole story on how Benjie built this little red monster read about it here. To see more from BCR check the gallery and their amazing parts catalogue.